av8rdav. Glad you decided to join our happy little groups. Sorry I can't help with the details you want, but there's sure to be a few happy to help. Just wanted to say G'day. Having built several, my suggestion would be a minimum of 45'-50' center of plane center of handle. This was with Cox Black Widows. The Brodak isn't making as much power but it's also a more reliable and predictable running engine. This is also depending upon your line choice. I would not fly that plane on .008's stainless. .012's would be my choice due to the fragility of .008's. If those engines are not fully broken in, I wouldn't attempt it. Brodak .049's are very good engines, but the fits on those engines are very tight.If one or both quit the plane could do a hard nose landing. The F-82 kit has a very poor design flaw in which the ply doublers on the front stop in front of the leading edge square. This is a well known stress riser that should never be used. In the event of a nose over, the front end of the plane will snap directly off right at this intersection. If your engines aren't reliable starters and aren't holding consistent needle settings, I would put them on the bench and run at least a dozen runs between the two of them prior to flying. Not to disagree with Ken, but I flew my P-38 on Dacron 35' lines with both Cox Black Widows and Golden Bees. But my plane was built to scale not to fly or do stunts and I was happy just to get it to do circles. Something serious like yours deserves better. Thank you for the reply. I'm currently breaking them in on a test stand. A little background on me and u-control. I first flew them as a kid and, until about a year ago, had not flown since graduating high school in 1984. Built a couple Goldberg lil satans back then. Was going through some of my old things and found a partial kit and got the bug back and built it. Just so that your aware of the construction of the Brodak engines. Those engines are very unlike Cox engines. The piston/cylinder of the Brodak .049 is AAC construction. Aluminum piston, Aluminum cylinder with chrome plating. This kind of technology doesn't appear in inexpensive engines. I will also mention that the instructions were written to be followed by the beginner. I personally know the individuals responsible for the making of this engine. It was unfortunate that they designed the engine and catered to the beginners. Therefore, the engine has very mild crankshaft timing. This produces lower rpm's but offers decent power to fly these models. It would've been awesome if they produced a additional crankshaft for those like myself that want more power from a engine. The fact that your using these on a twin is very beneficial. If you have engines that are timed and ported similar to the Brodak .049 , the ideal way to benefit from them is to use them on a twin. The reliability and power of these on your twin is going to be quite impressive when they're both dialed in. The instructions state to use 10% nitro. Yes, the engine will run on 10% nitro. However, they will start much easier on higher nitro and also offer better reliability and needling using it. I have found that shaft fit to the case to be very very tight on the engines I have personally and friends who have owned them. The fact that your currently running them is a good thing because many of them were sent back to John due to the owners never being able to flip them properly due to this condition. Once run in for a while, these engines start quickly, another important feature of having them on a twin. Experimenting with props is another important factor with this engine. The Brodak .049 is not happy using wider bladed props such as the Cox versions. The engine turns up more rpm's and offers less negative feedback when using thinner bladed props such as the APC's . The engine is not going to be happy with 6" props. This doesn't mean that it won't work, it's just that if 6 seems to be the desired size one wants, I would again turn to APC and use props such as the 5.7x3. The 5.5x2.5 is another good option. This is a modern engine and likes to be treated as such. Therefore flatter pitch props work better accompanied by narrower blades. Thanks, that's a lot of good info. I am using 5-3 APC props on the Brodaks and 15% nitro. I have noticed the Brodak engines run a lot more consistent than the Cox engines. I also have a couple of Norvel .061 AME engines. What is your opinion of those and how would you compare them to Cox and Brodak? The Norvel's are great little engines for their cost. Just as a example, a .15 sized model from yesteryear which has about 230 sq inches can be flown using a Norvel .061. On your Mustang, they would be very fast. I use the AME .061's for 1/2A combat and I have them competing against ball bearing .049's. Norvel offered the engines in 2 variations of cylinder porting, the AME version and the Big Mig. The AME is the higher performance version designed for combat use and free flight. The Big Mig works terrifically on low nitro fuels using hard tanks, the AME not so. The AME is designed to be run on crank pressure, muffler pressure of bladder pressure. I have also found the AME porting to be slightly problematic with the wrist pins coming out of the piston. The pin is staked and I have had my share of them come out and ruin the cylinder. This can't happen using the Big Mig. However, the fact that it happened to me could've been expedited by my prop choices which were just under 4". I prop to get the engine in the 30k+ range. I certainly have a formed opinion on all of the engines mentioned, but I have a place for all of them equally. I enjoy the Norvel's due to their power and low maintenance requirements. Norvel's generally do well on low nitro fuel aside from the AME which prefers higher nitro. These engines are great on glow plugs. Cox equipment generally requires a regiment of maintenance and parts. In addition, they run superior on high nitro vs low which also taxi's the glow plugs pretty hard. Plugs are not inexpensive anymore for Cox stuff. Now the Brodak engines really set themselves aside from both of the above. While they're no hot rods, they're decent running engines. As long as you keep them out of the dirt, your going to get a long time amount of enjoyment from them. Coupling them together on a twin is going to make the plane fly nicely. Overhead maneuvers will be a non issue assuming the plane is flying correctly. Back on topic, your nitro choice is perfect and your props are equally as good. As you mentioned, the Brodak engines are consistent. Cox Black Widow engines are all over the map. The Cox may offer higher rpm's, they're not going to do it consistently and that's the difference. I have my F-82 in the construction stage currently. I have the older version with the nylon mounts on the nose and not the beam mount like yours. I have 2 Cox Sure Starts slated to go on the nose. One receives a far superior run using the product/ horseshoe backplate and tanks. My buddy Dan currently flies his F-82 using two Cox TD's. That goes fast as can be. I have video of my Norvel running on youtube. The link below my name will take you there. 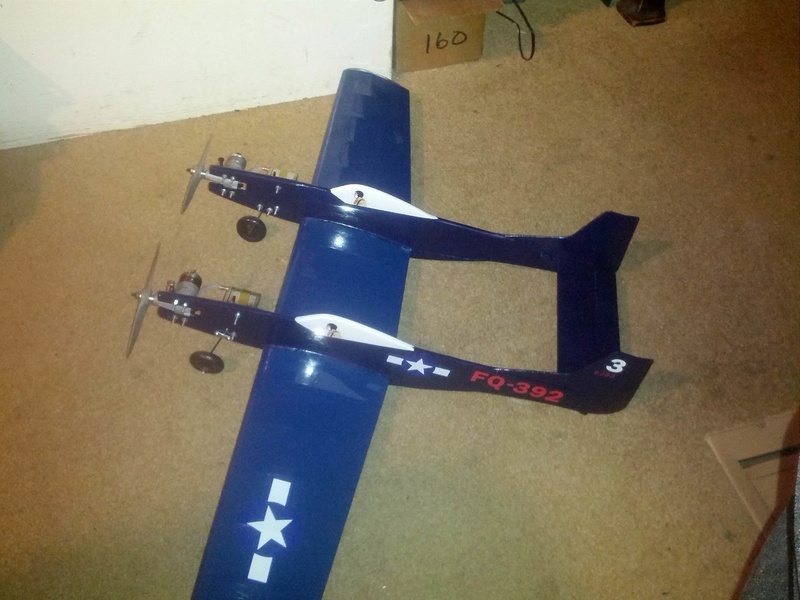 The F-82 I built has the plastic mounts to use tanked engines. Do you think black widows would be a better choice? I have about 6 of them. Also have some Tee Dees and Golden Bees. While I'm a pro Cox , I wouldn't use them on this plane unless your skill level is adequate to do so. More than likely, you will experience one of them running faster than the other or possibly not run at all. The end result of this can be catastrophic to your model. Integral tanked bees such as the Golden Bee or Black Widow is going to have very short runs and finicky. Typical issues such as one wants to run backwards, one doesn't want to run at all. The Brodak engines as mentioned will ultimately offer a much more consistent and flyable run. I'm not suggesting that your Cox engines won't work, I think success with the Cox equipment is much better had using production backplate engines with tanks. The Brodak and the TD share the same mounting pattern so they could be swapped at anytime. The weight between the two however will certainly change the way the model flies and you will have to compensate. The TD's though feeding from your tanks could prove problematic. It might work, it might not. I would certainly fly the model first with your Brodak engines. Flight of this plane won't happen for a while. I've got some others I'm going to get proficient with first. 3 Sterling Ruffy's that are ready to fly. A Sterling SE5 and a Sterling Mr. Mulligan. All powered by either OS .35 Fp or Evo .36 or Max S-35. The Ruffy was designed for engines like the Fox.35. The Max-35S offers a tad more but the weight is pretty much equal. The Max-S is much better constructed than a Fox .35 but it has some issues. Knowing the history of the MAX-S is important and what fuel went through it. It can be very problematic if certain parts such as conrod and wrist pin end pads are worn or wearing out. The MAX-S would be my choice for the Ruffy assuming it doesn't start nearing the 44 oz. range. Given your models and engine choices doesn't leave much room for which should rightfully go where. I'm assuming the SE-5 is a Sterling C series kit these were designed for a timely old style .35 which is what the MAX-S is. It also provides the correct weight for that model. The Ruffy was designed for a Fox .35 which is similar in weight. My opinion would be to use the FP in that model and add tail weight . There were two versions of the FP made, a iron piston version and a ABN version. The runs are almost identical but the iron piston doesn't like to be pushed as hard as the ABN. If you have the FP-S .35 it should've come with 2 venturi sizes. Knowing which one you have is also important which can also control speed and run time. The FP in the Ruffy would or I say could take almost 2 oz. of tailweight to balance it. The plane shouldn't be affected due to the large wing. The FP offers a lot more power over the baffle type .35's therefore a low pitch prop is in order. 10x4 - 10-5. A APC 10.5x4.5 is a good choice for that engine as well. The stock muffler for the FP could be a issue due to the very small outlet. The ball bearing EVO is really the power equivalent to a schneurle bushed .40 and that doesn't leave a home for that engine. The MAX-S and FP share the same bolt pattern and case length so both engines are interchangeable. The EVO though does not and therefore will not interchange. Mr.Mulligan is another C-series Sterling kit with a very small wingspan about 32". This like the SE-5 would utilize the older baffle type/bushed .35's. Fox,Mccoy redhead, MAX-S to name a few. Of your engine choices the MAX suits this plane the best . The FP and EVO are too much power for the Sterling planes. The FP could probably be tamed a bit to allow it's use in the plane by using a low pitch prop and 5% nitro . It's kind of like putting a Corvette engine in a cement truck. I meant to add this: The EVO would make a excellent option for your Ruffy but not quite in it's stock form. The Ruffy has about as many square inches as the Oriental. I believe it has almost 550 square inches in wing. The EVO would work great in terms of power. I own 4 EVO .36's. Here's the problems I found. The engine tends to run erratic with the remote needle valve due to air leak issues ( Not when new, but not far out from new). The rear needle valve which I strongly dislike make many things a issue especially in a full bodied plane. In addition, the smallest venturi offered is still too large. I purchased a Delrin venturi for the engine which utilizes a up front needle assembly like all other engines which allows the needle to be flip flopped and easy full bodied mounting. The venturi I purchased was from Jim Lee Machine Shop. I ran into Jim at a contest in North Carolina and a good friend of mine recommended to Jim the proper sizing he should offer for that engine. I found that the stock holes in the tongue muffler to be too small and should be opened up as well. I'm not a fan of the expansion muffler offered with that engine as it looks to be too heavy and restrictive. I run my EVO on full synthetic, it doesn't like too much castor oil. Even 50/50 is too much for that engine. It likes 16-18% oil content. Cool Power like Omega works very well in this engine. It's a well made engine with parts fit very well.